Lifelong commitment runs through the pages of the Summer 2018 issue of Glenmary Challenge. The magazine, due out in mid-June to early July, highlights the journeys of Richard Toboso and Charles Aketch, who made their Final Oaths in May. From Charles’ grandmother enduring beatings for the faith, to Richard’s observation of the quiet dignity of missionaries, both men have incredible stories to tell. 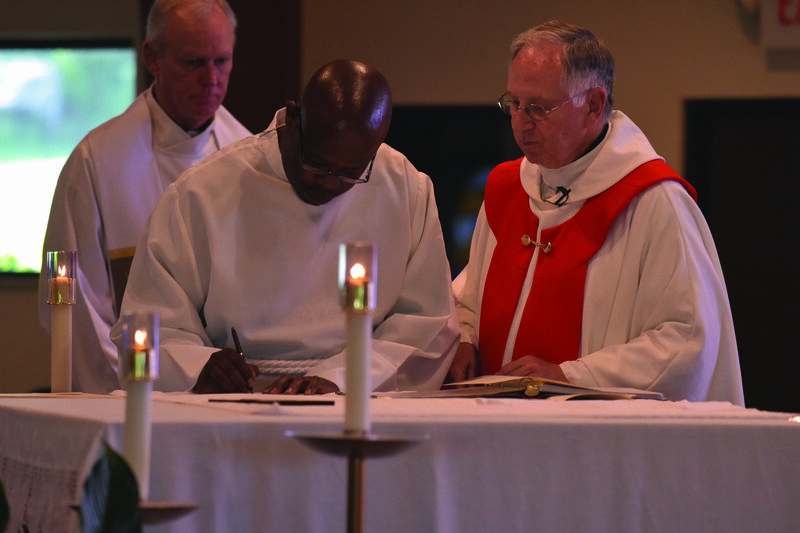 Each came from Kenya and have now professed for life to serve “the missionary apostolate in the rural areas and small towns of the United States and to the Glenmary way of life,” as it says in the Glenmary Oath. This issue also says goodbye to Father Frank Schenk, who died in April at age 102. The memorial is written by diocesan priest Father Joe Townsend. Father Frank was the first Catholic, let alone the first priest, that Joe had ever met. That relationship led Joe to become a priest as well. Father Aaron Wessman is still, God-willing, in the early years of his lifelong commitment to Glenmary. The society sent Father Aaron to Belgium for advanced studies several years ago, and the young missioner has now returned to the U.S. for his first mission pastorship. Father Aaron is using what he learned overseas to benefit the people of Bertie County, North Carolina. The summer edition also highlights the missionary lives of Father Bob Dalton, Father Wil Steinbach, and Brother Ken Woods. All three are “senior members,” meaning they do not have a specific mission assignment from Glenmary, but each continues to enhance the lives of those around them after 60 years as home missioners. Other highlights include Father Chet Artysiewicz’s column on racism, updates on the long-awaited Glenmary prayer book and a big announcement about Glenmary Challenge’s newest hire. The Summer 2018 Glenmary Challenge will be available online by or before June 25. To begin receiving Glenmary Challenge in the mail, click HERE. Glenmary Challenge has three goals: to educate Catholics about the U.S. home missions, to motivate young men to consider Glenmary priesthood or brotherhood and to invite all Catholics to respond to their baptismal call to be missionary by partnering with Glenmary as financial contributors, prayer partners, professional coworkers and/or volunteers.